Don’t miss out on my Preview Project (CUTE Domino set) and check out who (hint there are TWO) Create with Connie and Mary Design Team members who are offering BLOG CANDY today (TUESDAY)! The CAS challenge this time is to CASE something from the gallery of hskelly. I picked this card and instead of stamping on the background I decided it would look really cool to use some of my new Washi Tape. I played around awhile back with stamping on Washi Tape and what I found out is that if you use StazOn ink over the Washi Tape, it works just fine! You should try it! 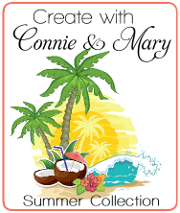 Don’t forget Monday start Preview Week for Create with Connie and Mary Summer Collection 2014! This collection features products from the NEW CATALOG…you don’t want to miss it! And you don’t want to miss my cool preview project! You can get a full FREE downloadable tutorial so you can make it too! This entry was posted in Challenge, Clean and Simple (CAS) and tagged And Many More, World of Dreams. Bookmark the permalink. 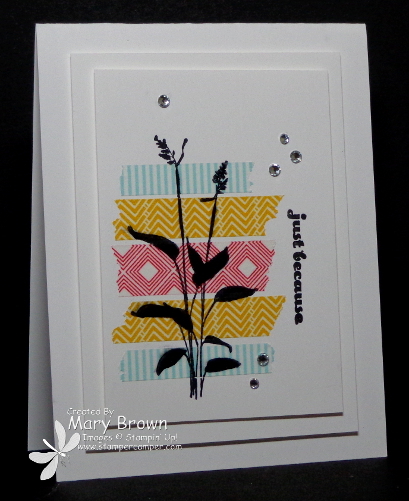 Did u use StazOn to stamp on washi tape? I didn’t have any luck with StazOn.